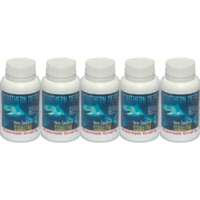 10% discount on 5 pack lactoferrin. Lactoferrin, natural immune supporting agent, manufactured from milk protein from New Zealand’s antibiotic free, BSE free, pasture fed, out door herds, supplied direct from New Zealand at lowest possible prices with no minimum order. Lactoferrin plays several biological roles related to its iron binding ability immune support and antioxidant activities. Lactoferrin supports the immune defences and balanced microflora and helps control cell tissue damage caused by oxidation and also facilitates iron transportation and binds the free iron and reduces the amount of oxidative free radicals released. Lactoferrin promotes intestinal health by scavenging iron and balancing healthy flora in the G.I. ract. By modulating healthy levels of iron in the body, Lactoferrin plays a key role in maintaining overall health. Lactoferrin is considered a multifunctional or multi-tasking protein. It appears to play several biological roles. Owing to its iron-binding properties, it is thought to play a role in iron uptake by the intestinal mucosa of the suckling neonate. That is, it appears to be the source of iron for breast-fed infants. It also appears to have antioxidant and immunomodulatory activities. Receptors for lactoferrin are found in monocytes, lymphocytes, neutrophils, intestinal tissue and on certain bacteria. Lactoferrin is abbreviated LF and Lf. Bovine lactoferrin is abbreviated bLF. The immune enhancing activity of supplemental lactoferrin might be accounted for, in part, by its ability to strongly bind iron. Iron is essential to support the growth of pathogenic bacteria. Lactoferrin may also inhibit the attachment of bacteria to the intestinal wall. A breakdown product of lactoferrin is the peptide lactoferricin. Lactoferricin, classified as a bioactive peptide, may also have immune supporting activity. A few mechanisms are proposed for lactoferrin’s possible immunomodulatory activity. Lactoferrin may support the growth and differentiation of T lymphocytes. Lactoferrin appears to bind uniquely in the region of major histocompatability (MHC) proteins and the CD4 and CD8 determinants on T4 (helper) and T8 (suppressor) lymphocytes; it bears sequence homologies with the MHC Class II determinant. Lactoferrin also appears to play a role in the regulation of cytokines and lymphokines, such as tumor necrosis (TNF)-alpha and interleukin (IL)-6. Lactoferrin’s possible antioxidant activity may also contribute to its possible immunomodulatory activity. Lactoferrin’s possible antioxidant activity can also be accounted for by its ability to strongly bind iron. Free iron is a major contributor to the generation of reactive oxygen species via the Fenton reaction. Adults – Take 2 x 225mg capsules per day as a conditioning dose, one in the morning and one at night for a month or two then drop back to 1 x 250mg capsule per day.